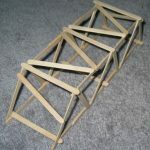 This popsicle stick bridge was made from 40, unmodified popsicle sticks. The bridge spanned 12 inches, was 4 inches tall and 3 inches wide. I used only Elmer’s white glue to build the bridge. It weighed 57.4 grams (0.13 pounds), and held 90 pounds. Its efficiency score was 712. 19 queries in 0.654 seconds.